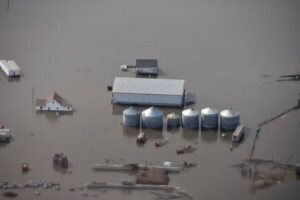 WESTERVILLE, OH — The National Ground Water Association (NGWA) says that floodwater containing dangerous microbes such as E. coli and coliform could potentially contaminate thousands of wells that are located in flood-impacted areas in the Midwest region. Over a million wells are located in flooded areas, and NGWA says a substantial amount of those could become contaminated. This is because many of the affected areas rely on groundwater to supply rural and small town populations. 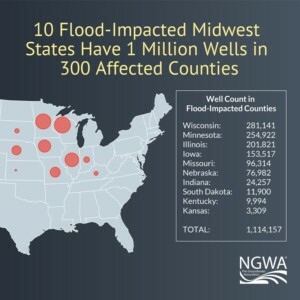 South Dakota has an estimated 11,900 wells that may be impacted. Household, farm and small business wells situated in valleys and plains could be in standing water for days, raising the potential for contamination, particularly if a well’s structure is cracked or faulty. NGWA recommends that owners test and monitor their systems. Additionally, disinfection and wellhead repairs are commonly needed after a flooding event. You can find more information on how to protect well systems before and after floods at NGWA’s online flood resource center.